French Silk Market – Gina Diamond's Flower Co.
February 14, 2015 – The 10th annual Silk Market was recently held in Lyon, France. Vendors were selling everything from pocket squares to bolts of gorgeous silk fabrics. We spent a morning there talki ng to designers and manufacturers and swooning over the large variety of beautiful silk fabrics and goods. 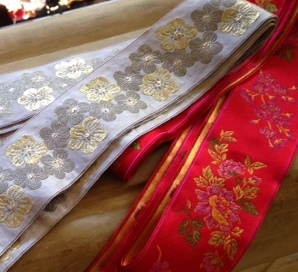 We purchased yards and yards of fabulous ribbon from Julien Faure and can’t wait for next year’s market. A little background about Lyonnais Silk: Lyon was the capital of the European silk market for centuries. By the mid-1800s there were 60,000 looms in operation and the silk trade employed an estimated 90,000 people. 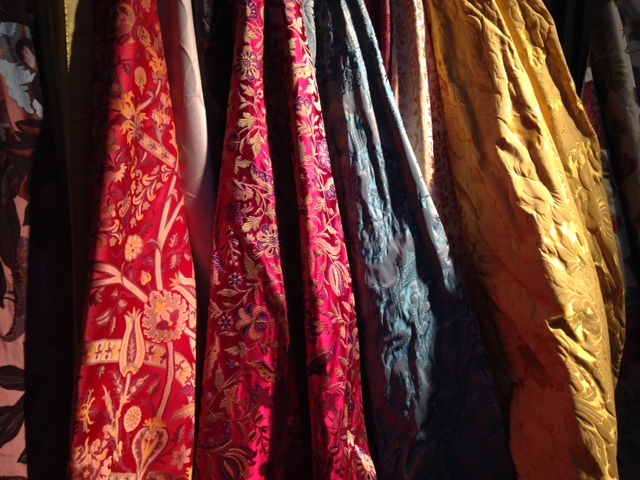 The luxurious silks found throughout the Palace of Versailles were created in Lyon. Though only a few silk manufactures exist in Lyon today, the silk industry left an indelible mark on the city which proudly preserves this part of its rich history. I have visited Lyon many times, what a great city! Wish I could have gone to the silk market. Lyon is a beautiful city. The history of the silk trade here is very interesting. The Maison de Canuts and the Gadagne Museum are both fascinating if you want to learn more of Lyon’s history. Here on our blog page we’ll talk about what inspires us: flowers, gardens, décor, table linens, home accessories and entertaining. We will share lots of photos and ideas that you can use to make your event memorable and your home more inviting. We’d like to hear about what inspires you as well so we encourage you to leave comments. Simply click on the title of the blog post you’d like to comment on and the comment form will appear at the end of the post. Thank you for visiting us and be sure to come see us in our shop soon!